We believe every BIG SISTER is a superhero! Let Superkid Capes help your big-sister-to-be feel extra special about his new role. 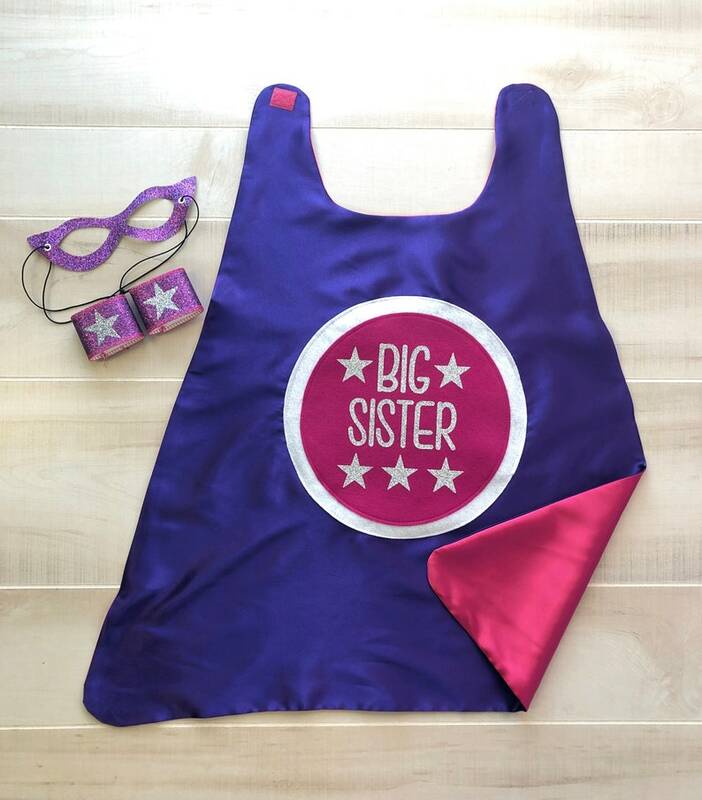 1 Super big sister cape with optional accessory wrist bands and superhero mask! This awesome big sister cape is double sided, with the design on the outside and a separate lining color. All our capes are hand sewn in our workshop by our awesome team of moms to ensure the highest quality! Our superhero wrist bands and masks are made of a durable sparkle material, and the sparkle does not rub off! Shipping: Your order will ship 3-5 days after purchase, sometimes faster! We have flat rate and priority mail options. Absolutely amazing. Fine with my custom requests and looks high dollar! Love love to be able to give these as gifts to 2 little excited big sisters! Thank you! These look great! Husband’s favorite gift from kids. ever.